Sitting in my local coffee shop this morning, this guy and his pet iguana come in to get a coffee. There’s quite a commotion because we don’t often see a guy walking with his pet lizard in the neighborhood. I toyed with the idea of taking a shot of him in the coffee shop but there were just too many people engaging him to make that practical. He left after a few minutes and then I left the cafe a few minutes after him to head home. I noticed down the block he was walking in the direction I was headed and then I thought I could catch up with him. 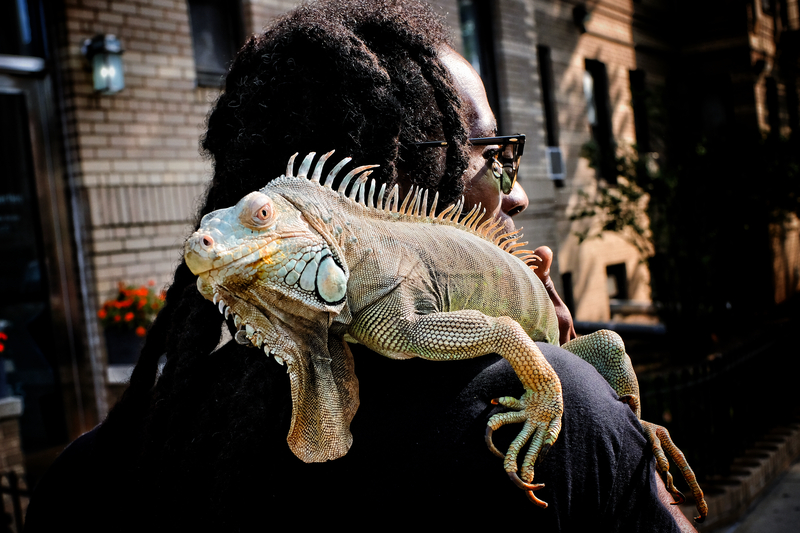 I did about a block away and started talking to him about his beautiful iguana. 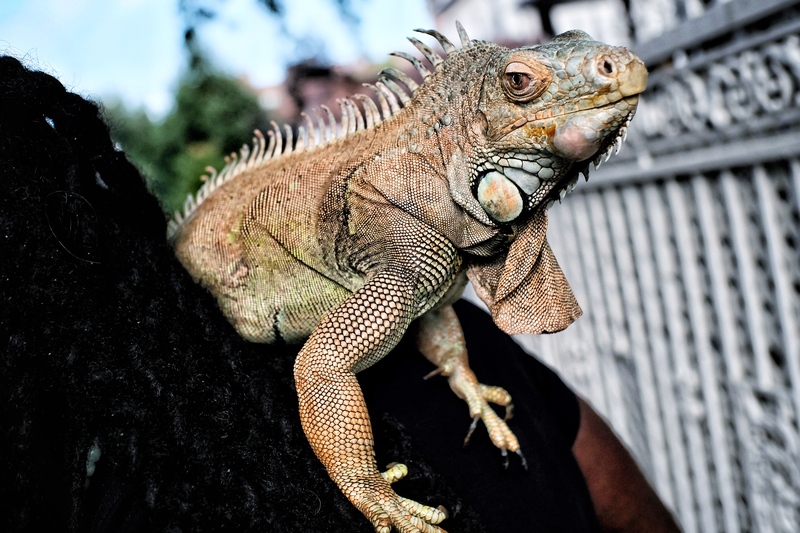 He told me his name was Luigi and the iguana was Money, or so I heard him say. We walked a few blocks talking about our pets and watched as other passersby decided to cross the street rather than walk by such a huge lizard. Luigi told me how small Money was when he first got her and I told him about my adventure in finding my cat Opie on Ocean Parkway. At one point I asked if I could photograph the both of them. He agreed. I’m sure he get’s asked that multiple times a day. 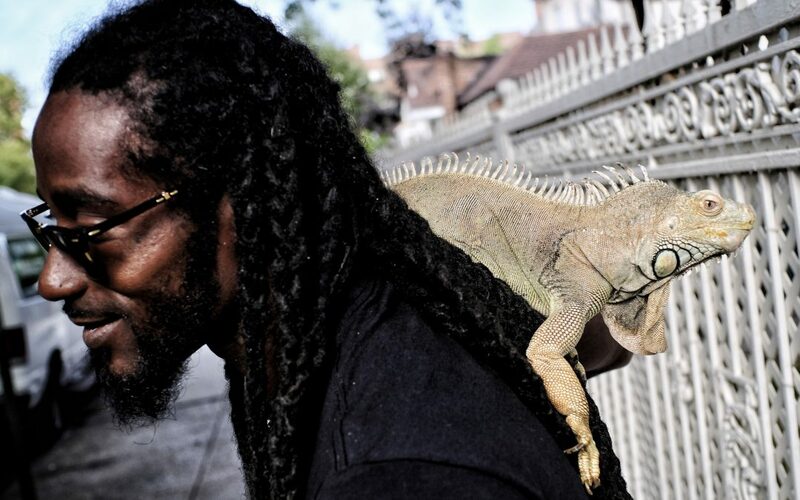 I mean, the dude’s carrying around a small dinosaur on his shoulder! Sometimes all it takes is a camera and something uniquely interesting happening on the street to create an opportunity. Always push the situation as far as it can go. You never know what can happen. Sometimes something magical. Tech specs on the image: Shot with Fujifilm X-T20 with a 7artisans 25mm lens.